I have seen several variations on this, several pieces that go into causing it. The neat thing about it is that the ‘fix’ is the same no matter what the cause is. One cause can be training. When I think about a horse that has been trained to be robotic it makes me sad. The easiest way to describe this training is forced. Essentially, for a horse to be trained to be robotic, he is trained physically to have certain responses without his mental condition being assessed. Horses that pretend to be robots are similar to people that have also been trained to be robots. Both are hiding their true self and much of the time it is because of pressure that has been applied. Another cause for a robotic feel from a horse is their personality. Some horses are naturally more serious. Some are naturally more playful. The ones that are more serious will often express that trait everywhere, not just in ‘trained’ places. For example, many serious horses won’t even eat treats. They also tend to stay out of trouble, they are NOT the ones who: open door, search for treats, pick up things with their mouths or are overly curious. They seem to be serious and a bit distant. Early on I thought these horses must have had a bad experience when they were younger but I don’t think that anymore. I have seen foals that were serious just like you will see children that are more serious. There is nothing wrong with serious if it is honestly who they are. Interestingly, if you want to see these horses show more expression the ‘fix’ is the same for both; be more creative. Years ago some people brought me a reining horse they wanted to sell. The person who trained it said it didn’t have enough heart. The owner brought it to me to see if I knew anyone who might want to buy the horse. He was very well trained but it was very evident that he was a robot. I agreed to ride him and look for a buyer. It was fun to see what would help ‘wake’ him up. The first thing I did was to put a pole in the arena. Just a simple wooden pole you might cross in a trail course. The gelding approached the log showing little expression but as we got close, he wasn’t scared, but his ears started flicking around. It was as if he were quickly searching his data base for anything that he had ever experienced like this. That moment was critical. If I had rushed him or pressured him he would have gone into emotional hiding again and applied the same rules he had learned during reining maneuvers. I was laughing. He never lost forward motion and stepped over the log but I knew that creativity was going to be key. I could have set up 20 obstacles that day…but wouldn’t that be overwhelming? And most horses that are robots have already been trained with the use of overwhelming pressure. Over time I introduced another log. Then for fun I put the logs in strange places. Whenever he started to go into his ‘trance’ I would randomly do something unexpected. Maybe I would dismount and pick up rocks from the arena. Maybe I would stop and side pass over the log. The best was when I took him trail riding. His first ‘trail ride’ was simply leaving the arena. The lawn, to him, was a trail. A field that had not been mowed was eye popping as the grass tickled his belly. By the time we finally went on a full blown trail ride he felt as if he were excited about what could be coming up next. My goal was not to remove all the training he had ever had before. It was to show him that he could look forward to small, pleasant changes to his routine. Imagine if a child had been sent to a very strict school for years. Sure, you could remove him from the school but why not make small changes inside of the school routine. Small changes, leading to bigger ones, would be amazing and inspiring to the student. It reminds me of the movie Dead Poets Society staring Robin Williams. Some horses are naturally more reserved and others have been trained to be that way. If you want to see either one get more alert or inspired try adding creativity to your riding. It will help your horse and who knows…maybe it will even help you. ← Can you ride a horse well when you feel guilty? Horsemanship is not a big thing, it’s a million little things. I have a two year old haflinger mare who in the field is playful with the other horses, a downright bully to my mini mare and runs and is curious pulling out any hoses or ropes plain getting into mischief. Does well in the round pen will move off well. Can be a bit pushing with my teen girls when they go in with her or work her, but respectful of me. I started saddling and sitting on her but for as much as she goes and goes any other time, when I get on she will not move. I bump her for 20 min get a step and stop as soon as she moves, but she only takes a step. She is like a rock happy to stand all day, will be quite the bomb proof girl even without exposure to new things, but having trouble with just the walk thing. Just thinking she doesn’t sound like the serious horse but playful isnt when riding. Not sure how to go without pushing too much and making her sour either. I ponied her off my gelding with one of my teens and that went okay other then my teen not really knowing what to do as she is a beginner as well. What do you do with a horse that is too much whoa then go? That was An interesting question. However I think the more interesting aspect is some horses just have a more serious personality. I seem to have one of the later, an old gelding, who is as solid as you can get, but it has taken him years to take peppermint. He’s always been really reserved and distant, until he met his barn Buddy brought him out. His barn buddy would eat anything, now the old gelding does, he in turn has taught my very picky mare. Now everyone, eats watermelon, bananas and granola bars trail riding. He’s also a more social horse, with people. Just an observation. Interesting. I also think that horses, like people, enjoy different things. Horses personalities play into what they are happy doing just as our personalities play a role in the careers we enjoy. Some horses hate change and love to do the same things over and over because they already know what to do and they are good at it. They know they can please their rider and earn that reward. Others love change and get bored with the same old, they stop performing with heart because they’ve already mastered it, so what’s the point. They are driven by learning something new and being challenged. The other issue I see seems from what Stacey said, what I call the “under-reacter”. My mom has one of those and when he’s truly frightened he will widen his eyes and flick his ears… That’s it, that’s all the notice you will get. He got a rope under his tail on the trail, he clamped his tail and sat down unwilling to move. The first time I took him to an arena he stuck his head out of the trailer, saw a bunch of new things and pulled his head back in, he wasn’t coming out. Where most will buck, jump, run, etc. He freezes. In the end you need to spend time with your horse doing a variety of things so you can get to know them. Give them time to express themselves. Ask but let them think about it, this is where their heart comes from -willing because YOU asked not because they were trained to listen. This only comes from friendship. 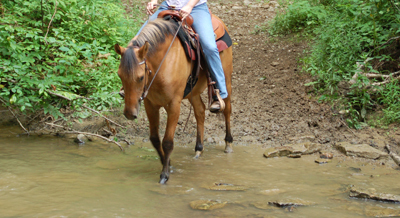 Stacy, I bought an older trail horse that didn’t have a lot of training but knew what his job was. He was very sensitive but buried that tendency under a “robotic” demeanor. He was reserved and hard to read. My farrier commented that he had learned to “keep his head low and not be noticed to avoid trouble”. He was distant and didn’t seem to be present with me when I worked him. I worked on him by rewarding every try whether or not it was what I wanted, and ignoring wrong responses to cues. He began understand what I wanted and eventually became more expressive and responsive. He is very sensitive, tries very hard and is a dependable mount for myself and the kids that take beginner lessons on him. His soul shines out through his eyes. He is still serious about his work but not wary and suspicious of people any more. Great article, Stacy! I have been training horses for years but this year one of my two year olds is as you describe. I call her “dull” but “robotic” describes her behavior as well. I have started (and finished) many of my own that I raised from birth and have never had one like this so I am a little baffled. I like my horses to have lots of personality and the other two year old certainly has. This one is, for lack of a better word, dull. I train in an outdoor arena and in between rides she runs out in a field with three others with lots of room to run and explore and I do see signs of her waking up to the world a little. As her training progresses, I am including other things as you suggest and I hope this will make a difference. Since I have access to riding outside the arena, there will be ample opportunity to introduce her to new situations. It’s nice to know you would do much the same things I am. This might sound a bit ‘out there’, but I would try her on Omeprazole for at least a week, and see if there is any change in her. Good Luck. Stacy, I have had that same experience with a horse that had been trained to death in Reining……… and then never really made it to the show pen…….. as soon as he was given to me I started many diff changes to his old routine……… one of them was putting him on cows…… now today 7 years later he has the most positive attitude and his personality has blossomed…some people don’t appreciate a horse with personality, but I thrive on it and my horses will do anything for me……….wish more people would read your blog and appreciate what your sharing. Wow!!!!! Thank you Stacy, your generosity is overwhelming. How does one thank you enough? It is like I have been putting a jigsaw together without having the picture on the box. You just gave me the picture. Thank you, thank you!! Ps: You would not believe the amount of stones I have thrown out of my arena. To have your blessing of my crazy stone throwing gives me a great deal of peace.